Sims come in all shapes and sizes. 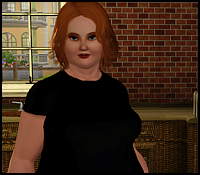 I like to have a mix of sims in my game, but when reading stories and legacies I often see pictures of merely ‘pretty sims’,who bear a close resemblance in character to Mary-Sues. These sims, mostly female, are always ultra-skinny, with big heads and big eyes and big hair. And to me they all look the same. It is pure joy to find stories that stay away from cookie-cutter sims. Anyway, my point with this article is to show how great a sim can look, or how true to character, by sliding the skinny-slider more to the fat-side. I took a sim I made earlier out of the bin and made her skinny. I then noticed that her face was still quite full and round, due to her full cheeks. It just did not look right. So I also made her face skinny, to match her frame. When she looks at you in the camera, you can see a possible character look out at you. She is obviously the skinny sister, maybe a bit lethargic, except when it comes to exercising. She may be a bit harsh, too. Maybe her heart has been broken too many times. Then I took the same sim and pushed the slider all the way to ‘fat’. But then the face look too slim! So I added some more cheek, jowls and made her head ever so slightly more wide. Note that sim-breasts always look like melons stuffed in a bra, when set to the biggest setting. Still, I think it looks well on this character. She still has a slightly harsh look to her, but to me she seems a little more crafty than her skinny twin. If we were to speculate, it would be this twin who would try to outdo her sister in being mean. When I set out to create a character, I always try to fill in as many blanks as I can. First, I set up a basic idea, like picking a stereotype. Let’s try two opposites this time: I choose a Hippy-girl and a Socialite-girl. The Hippy-girl is vegetarian, loves nature and animals, wears sensible but colourful-folksy clothes. Her hair will be sensible, something that doesn’t require hours of preperation each morning. The Socialite is all about looks and perception. She want people to look at her and envy her for her wealth and her beauty. Even if that beauty is not hers naturally. Her clothes will be elaborate and expensive, and her hair will show she has the time and money to get it done by the best stylist. And with the same sime as a basis, I came up with these two twins: The hippy girl looks like your regular girl-next-door, with a fresh and no-nonsense attitude. Because she is vegetarian, she is also a little bit skinnier. She loves being outdoors, and she loves being by herself. Her twin sister is a little fatter, because she tends to drink and eat a bit more. And she only really exercises when she dances at parties. She may want to shed some weight, to fit into that new dress though. I gave them both the hot-headed trait, just to see some sparks fly. 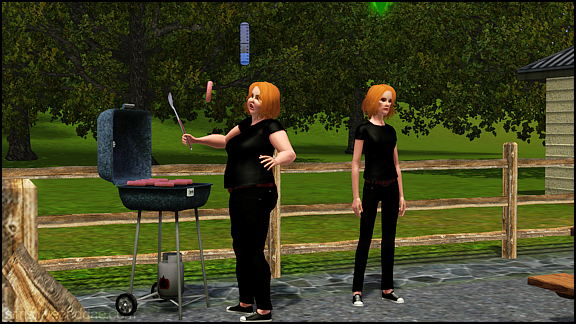 So starting with the same sim, I was able to create four different characters. They are still blank enough to create a story around. And each of these sims is unique, with a starting point to start writing or playing around with. They do not have to be all pretty and the same, so make sure you use those sliders a well as outfits and hairstyles.